This lesson provides guidance about how much detail to include in your test scripts. 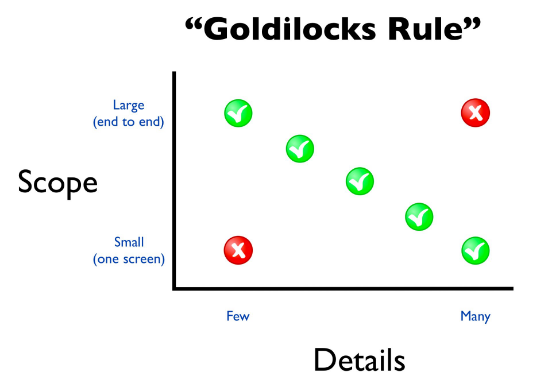 The "Goldilocks Rule" helps you find an amount of detail that is "just right"
If your tests cover a large scope, as in a set of end-to-end tests of a process, you focus first on entering only the most important elements of that process into Hexawise. If your tests cover a small scope, as in tests that focus on a few items on a single screen, the amount of detail you will want to include in Hexawise is higher. Too much detail can get in the way of your testing objectives. Passive fields should not impact business rules. An example of a passive field would be an optional text box that a customer service representative might choose to enter notes into during a call with a customer. If the information entered in that box should not impact the outcome of the transaction, focus less of your testing efforts on it. Active fields should impact business rules. An example would be the selection of a specific model of cell phone. When a customer selects the latest iPhone model, the order processing software should recognize that fact and ensure that the customer is charged the appropriate amount for it, etc. As you enter your test inputs, consider different possible options for how you select them. 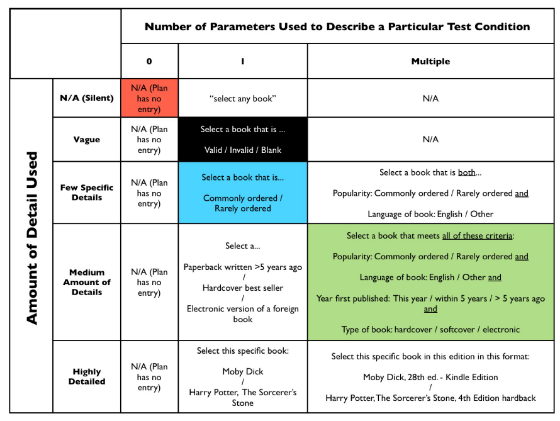 Green: Include multiple Parameters, and instruct the tester to select a test condition that meets all of those criteria (e.g., in the example above, one of the test instructions might read, "for this test, select an English language book that is rarely ordered, was first published more than 5 years ago, and order a softcover copy of it."